This recap of the 2010 NMHC Apartment Operations and Technology Conference is a guest post contributed by Kim Duty, VP of Communications for the National Multi Housing Council. 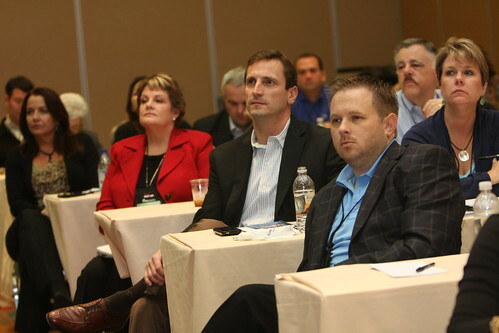 Leading apartment executives gathered last week in Dallas, TX for the 2010 National Multi Housing Council Property Operations and Technology (OpTech) conference. While there was a lot of healthy debate at the conference, it is clear that sophisticated technology-based tools have dramatically changed the apartment industry in the last 10 years. From marketing to pricing to data mining, apartment companies are leveraging technology to transform their communications and their operations. If there was one theme at the conference it was the need to continue to advance the industry's embrace of technology to do business smarter, quicker, better. "Go out there, try it, keep analyzing it and change it to improve it," said one presenter. And if you want to know where technology is headed, go to a college campus advised another. In a clear evolution from a conference that was once focused on what kind of wiring to run to properties, the dominant theme at this year's event was marketing with an emphasis on measurement. As Drucker & Falk’s Dan Haefner noted, "if you can't measure it, you can't manage it." Gone are the days when subjective "I think, I feel" beliefs guided marketing strategy. Today's companies are using key performance metrics to refine their advertising programs, analyzing cost-per-lead, cost-per-lease and visit set ratios. Panelists recommended cutting any source that costs more than $50 per lead and focusing on those ad sources costing between $20/lead and $50/lead when refining media buys. They warned, however, that properly sourcing leads is a big problem in the industry. One analysis showed that 70% of leases were attributed to the wrong source. They urged companies to use call center data and guest card matching through a lead management system before deciding which marketing sources to keep. Conversion rates are equally dubious. Keith Dodds (AIMCO) reported that when they experimented with not holding site staff accountable for conversion rates and to instead accurately report traffic, traffic was up 50%. Don't make decisions on bad data was a recurring mantra. We have too much data and not enough tools to make sense of it was another. Firms agreed that lead tracking and revenue management have to work together in developing a marketing strategy, since firms make money by pushing rents. Using today's data-driven tools, companies can adjust their lead streams depending on whether they are pushing occupancy or rents. One of the key topics at the event was marketing, with a vigorous debate on whether social media is a productive outlet for apartment firms. While apartment executives may disagree about how much of a firm's resources should be allocated to social media, they generally concurred that there is a major industry shift underway in how the industry communicates with its customers. During a debate on the pluses and minuses of social media, Jamie Gorski (The Bozzuto Group) argued that social media is crucial because it “protects and extends your brand” and lets you hear what your customers are saying about you. "To say that it hasn't generated any leases is missing the point. Social media is just another form of communication with your customer," said Gorski. "Would you not answer an email?" Arguing the other side, Donald Davidoff (Archstone) replied that social media creates a lot of activity but not a lot of results and isn't easily quantified. Asked whether social media could be an external link strategy to drive traffic to the company's web site, Davidoff reported that bounce rates from Facebook are twice as high as from an ILS. Todd Katler (BRE) concurred that there are lots of ways to keep your apartments full that don't involve Facebook or Twitter, plus social media is not scalable. Both agreed that they may feel differently in three years and conceded that it is important for reputation management. Thompson said firms should “either embrace social media or don’t do it at all. Don’t do it halfheartedly. If you do it and don’t do it right, it’s worse than not doing it at all.” To be successful, stop thinking of yourself as a marketer and start thinking of yourself as a publisher. Despite the disagreement, it was clear from the hallway conversations and other panel discussions that figuring out social media is high on the industry's "to do" list for 2011. One thing the social media panel agreed on was the importance of embracing apartment rating sites like ApartmentRatings.com and Yelp because apartment residents are using them to make leasing decisions and they have enormous relevancy in organic search results. Drucker & Falk’s Dan Haefner shared their initiative to get supportive residents to post ratings. He says the company has spent less than $200 a site on education and awareness building and has gone from a 20% rating to an 80% rating. Once they get above 80%, they link the property site to the ratings site. Last year's buzz word — mobile marketing — was still a hot topic this year, but firms report that their mobile applications are getting more traction with existing residents. Greg Lozinak (Waterton Residential) reports bounce rates (users clicking away from the front page) of 50% for prospects with their mobile campaigns, but just 30% for residents. Lozinak reports that 61% of their resident portal traffic is mobile, compared to just 39% of prospect traffic. He explains that today's renter cohort is more likely to leave their apartment without their wallet than their cellphone. "It's their first screen of choice" he says. This year's buzz was about QR (Quick Response). These easy-to-produce bar codes can be added to brochures, billboards and web sites. They can store text (instant coupons), URL links, geographic coordinates and more, and anyone with a smart phone or a mobile phone with a camera can scan them. Research reports that 71% of consumers polled are willing to download and use mobile bar codes. Lynette Hegeman (Gables Residential) reports they are building a mobile landing page prospects would land on after scanning the code. They are also developing one for residents and using it to link to Facebook, maintenance requests, event calendars and more. When asked "What's next?," one speaker advised: "If you want to know what's next, go to a college campus and see where technology is headed." Despite a noticeable emphasis on marketing, using technology to serve existing residents was a common theme. As Laurie Baker (Camden Property Trust) said, "residents find us online, can apply online, then they move in and we put notes on their doors." In focus groups, residents told them they hated having notices put on their doors. When asked about budget priorities for 2011, firms cited using technology to drive resident retention and create a better user experience. This includes allowing online renewals, deploying revenue management for renewals and creating touch points at different times in the relationship. Reiterating last year's takeaway, panelists said repeatedly that the way the industry communicates with existing residents has changed. Half want to be communicated with via text or email. But the industry needs an IT solution for resident communications. Property management systems don't have fields for Twitter or Facebook accounts or the ability to designate preferred communications, much less act on them. Another recurring conference theme was revenue management software and the way it's transforming the industry. During the downturn, some companies disabled their revenue management due to fear that it would lower rents too quickly. Riverstone's Walt Smith said he could count on his fingers the number of clients who trusted it when rents were going down. But AvalonBay’s Leo Horey said revenue management “works through all phases. But these are tools and they have to be used in conjunction with other tools and systems. Don’t just turn it on and let it go; adjust it. Mutz agreed, saying it’s an amazing technology if it’s used right. Now his firm is working on rolling out a module for renewals. One sign of how far the industry has come in just a few years: Mutz said 67% of his firm’s leases this year will be online. “Three or four percent of the time we first meet a new resident when we hand them the key, just like a hotel.” Many of these sight-unseen renters tend to come from overseas, so making your web site available in different languages definitely appeals to them. Missed a session? Catch up! Presentations from the conference are available to NMHC members here. 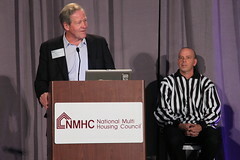 Visit NMHC's Flickr Page for photos from this year’s event. The Council has also created a Social Media Listserve to allow members to exchange ideas and pose questions on the topic. For more information, visit www.nmhc.org/goto/socialmedia. Next year’s 2011 NMHC Apartment Operations and Technology Conference & Exposition will be held in Fort Worth, TX, November 6-8, 2011 at the Omni Fort Worth. What are your top technology priorities for 2011? Does marketing top the list, or are you more focused on operational issues? Leave your takeaways in the comments.